Kitty Doe has spent her life as an Extra, an illegal second child who was sent to live in a group home at birth. She has tried her hardest to prepare herself for the day when she would take the exam that would determine how she would spend the rest of her life, in hopes that she can score high and earn a Ranking of at least a IV. However, when Kitty earns the ranking of III and her job assignment is to work in the sewers in Denver, a city thousands of miles away from her home in D.C., she decides to do whatever it takes to stay near her boyfriend, Benjy. When she is presented with the opportunity to become a VII, the highest Rank possible, she is unable to refuse, even though she knows there must be a catch. The catch is that Kitty will have to be Masked–surgically altered to look exactly like Lila Hart, the manipulative prime minister’s niece. She will have to learn to be Lila so that she can take her place and the country will never have to know that the real Lila was killed. However, she must not only be Lila–she must stop the rebellion that Lila was stirring up, even though it is something that Kitty herself believes in. This was such an exciting start to what seems to be a promising new dystopian series! This book had a ton of twists and turns and I found myself unable to put it down. Kitty is a really great character–she is dyslexic so she is unable to learn how to read, yet she doesn’t let that stop her from learning. She is very smart and is able to memorize entire books and speeches after hearing them just a few times. She is extremely self sacrificing and brave, and she stands up for what she believes in. She was a great heroine and I loved her growth from beginning to end. The world that Aimee Carter creates reminded me a bit of the world in The Selection by Kiera Cass. Like in The Selection, the people are assigned numbers or Ranks that determine their place in society. While in The Selection this was determined by family (children are assigned the same rank as their parents), in Pawn every member of society takes an exam that determines their Rank based on their intelligence. IV’s, V’s, and VI’s live in a completely different part of the city than I’s, II’s, or III’s and are given more money and privileges and have better jobs and housing. III’s and below live in run down areas of the city and are given menial jobs such as sewer maintenance. Carter paints a vivid picture of this society and I really enjoyed the world building in this book. The only thing that annoyed me a bit was how Kitty’s world at times seemed to revolve solely around Benjy. I get that he’s the love of her life and he’s been one of the only people in her life for so many years, but I wasn’t nearly as interested in their relationship as she was. I actually felt like Kitty had more sparks with Knox, and I would’ve liked to see that relationship explored a bit more. 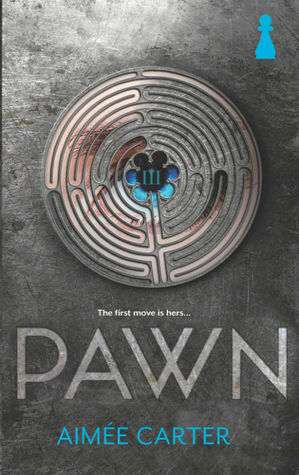 Overall, Pawn was an exciting book that kept me on the edge of my seat! I highly recommend this to any dystopian fans! Pawn will be released on November 26, 2013 and is the first book in The Blackcoat Rebellion series.